December 12th in Viral, Wordpress Plugins by Wordpress Jedi . Webmasters are always looking for new ways to engage their customers and keep them coming back for more. 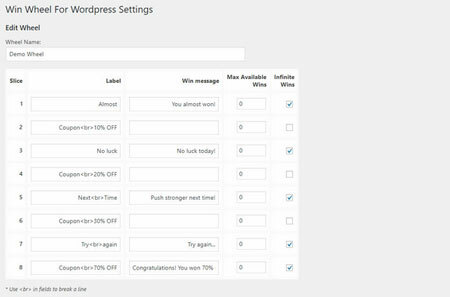 Win Wheel for WordPress is a handy plugin that lets you add a wheel of fortune to your website to reward your loyal visitors. It comes with fully customizable slices and win messages. Win Wheel offers 8 customizable slices. You can collect emails of your visitors before they spin. You can change label, win message, max available wins, and other options from the Settings page. The plugin has anti-cheating mechanism built-in and reCAPTCHA support. Webmasters get to log all data for every spin. This is a paid plugin by 34si.